We've managed to escape some rain for a few days now, and have another beautiful sunny day amongst us. This is the second day in a row without any humidity, and a nice cool and fresh north wind rolling in off of the lake. Without question, these are my favourite days to be at The Saw! Over the years, courses in Ontario have tried many different approaches to moss control. Trials such as dawn dish soap, a baking soda concoction, various herbicides, and even various fungicides have all been tried without any real success. Sometimes we saw some reaction from the moss, only to have it re-appear shortly afterwards. Raising mowing heights had been reported to decrease the amount of moss, but was not the end-all be -all solution. Finally this season we did see a product registered in Ontario for use against moss, but again, it has been left with mixed reviews. Much like our Ant issue, we are at the mercy of the products given to us by the government. Anyway, back in the spring, during the Pro/Super Challenge that Paul and I attended in Uxbridge, I had the opportunity to speak with several very prominent, very intelligent Superintendent's from across the province. During this time, the conversation arose about moss issues, and techniques which had been tried to control it. To make a long story short, I was given some tips and tricks with regards to control, and I have spent considerable time researching, and trying to find the best solution. 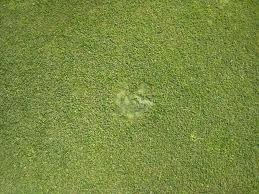 Now as you can see the green was spot treated in the areas of known moss presence. The tricky part about moss, is that it may be present in the turf without actually rearing its ugly head. The purpose behind using this green as our trial green, is that we are unsure of the effects of this product on our bentgrass species. I was warned prior to using this product, that it more than likely will give the appearance that the bentgrass is burned, however, it will return after a couple of weeks. So just to be clear here; we are going to see some rough looking turf on this green in the very near future. I will be monitoring it very closely to see its effect on the moss, but am fully prepared to deal with some rough looking turf in the hopes of finding a solution to this moss fiasco. As always, if you have any questions feel free to contact me at jamie.downton@sawmill-creek.com.